NCUA Chairman Debbie Matz congratulates Linda Jekel, director of the Washington Division of Credit Unions, after Jekel is awarded the NASCUS Pierre Jay Award, which recognizes support of the state charter. 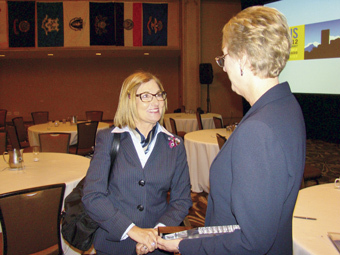 DENVER — The NCUA’s opt-in process for low income credit union designation may expand to include state-chartered credit unions, NCUA Chairman Debbie Matz announced last week during her keynote speech at the 2012 NASCUS Summit. The agency hopes to put the program into play later this month by working with state regulators to identify eligible state-chartered credit unions and reduce the red tape required by the NCUA.